You can click or hover over the map to show a state's crime information. The rates are per 100,000 people and calculated using 30 day months. Intentional homicides include feminicides. Oaxaca did not submit data during several months in 2015 and 2016. Each month the Secretariado Ejecutivo del Sistema Nacional de Seguridad Pública publishes crime information on its website. This website downloads, processes the data, and presents it in an easy to interpret format. Kidnappings, homicides, and extortions refer to victims; car robberies to police reports. Car robbery includes the crime of robo de coche de 4 ruedas only. Homicides include feminicides. 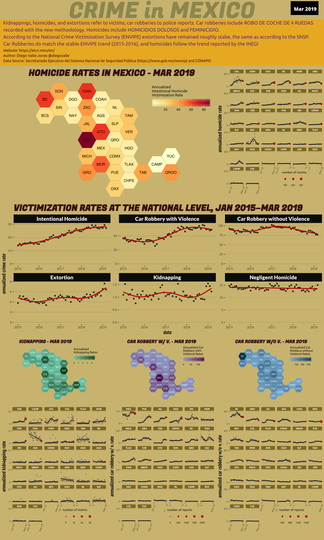 According to the National Crime Victimization Survey (ENVIPE) extortions have been rising, but according to the SNSP decreasing. Car Robberies do match the ENVIPE trend, and homicides follow the trend reported by the INEGI. INEGI homicide data tends to be more precise. Forensic coroners and the INEGI simply don't have the same incentives to lower the number of homicides that happen in Mexico as the police. In addition to adding deaths from Legal intervention, operations of war, military operations, and terrorism to the INEGI homicide count I used a statistical model to predict the intent of deaths of unknown intent similar to what I used in this post. The disadvantage of using the INEGI data is it is usually more than a year out of date. Detecting municipios with an unusual number of crimes should be the cornerstone of any crime fighting strategy. This website helps monitor crime spikes so that the Mexican government can take prompt action (LOL). Crime is not uniformly or randomly distributed in Mexico, with this map you can find the crime hotspots in Mexico. See and understand where crime is happening, and don't believe anything the government tells you until you check out this interactive map.